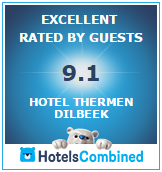 Relax at Thermen Dilbeek and stay in one of the most relaxing luxurious hotels of Brussels! Hotel Thermen Dilbeek, located in the building, is a luxurious hotel located in the green vicinity around Brussels only 500 m from exit 12 on the Ring. Free Wi-Fi is available throughout the hotel. The hotel offers spacious rooms with king Auping beds and fireplace, a flat-screen TV both in the room and in the marble bathroom, coffee/tea facilities, a mini bar and safe. All rooms are individually airconditioned. The suites also offer a kitchenette and dining space. A large breakfast buffet is served daily in the Exit-12 restaurant which also offers a relaxing setting for a lunch or an extensive dinner. The hotel offers a large private parking with camera surveillance free of charge, room service and a brand-new fitness club . Hotel clients have free acces to all thermal facilities and can book their massages, facial treatments, manicures, pedicures, ... with the beauty farm. Brussels Airport is a 20-minute drive away, Brussels Midi trainstation is at 6 km and the Brussels Grand Place is at 8 km. All children under 12 years pay 35% of the room rate when staying in the same room as the parents. Luggage can be stored at the reception upon demand.